SCVHistory.com LW3143 | Film-Arts | Gene Autry Stars in 'The Singing Hill,' Placerita Canyon, 1941. 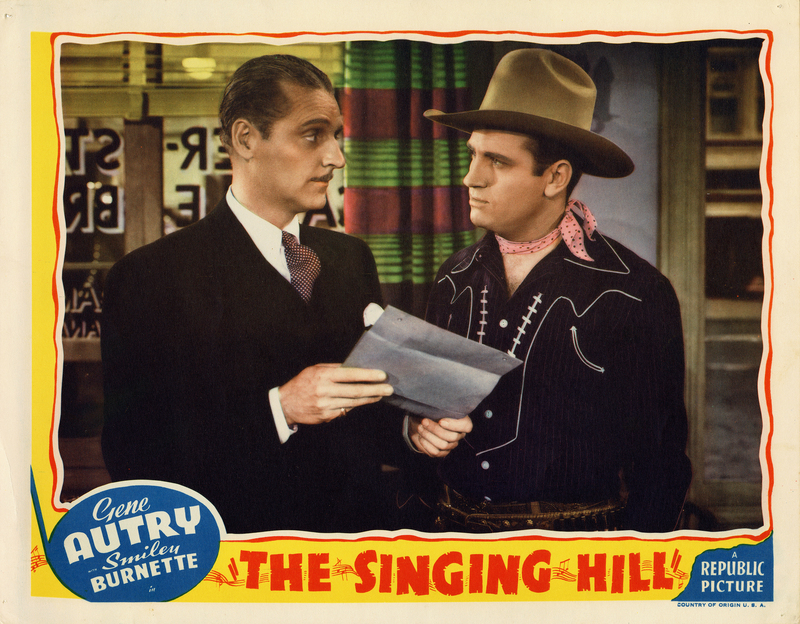 Gene Autry Stars in "The Singing Hill"
Lobby card for "The Singing Hill" from Republic Pictures, 1941. Filmed in part at Andy Jauregui's movie ranch in Placerita Canyon, "The Singing Hill" stars Gene Autry, who would own a movie ranch of his own in Placerita Canyon a decade later. "The Singing Hill" also used what is now Red Rock Canyon State Park. Directed by Lew Landers, the film features Smiley Burnette, Virginia Dale, Mary Lee, Spencer Charters, Gerald Oliver Smith, George Meeker, Wade Boteler, Harry Stubbs, Cactus Mack and Jack Kirk. Uncredited cast includes, among others, local (Santa Clarita Valley resident) character actor Dan White. LW3143: 9600 dpi jpeg from original lobby card purchased by Leon Worden.